From the digest: The Value of Design | Wide Open Co. There is growing evidence to suggest that design-centric companies outperform their peers. Don’t believe it? Other sources confirm it. 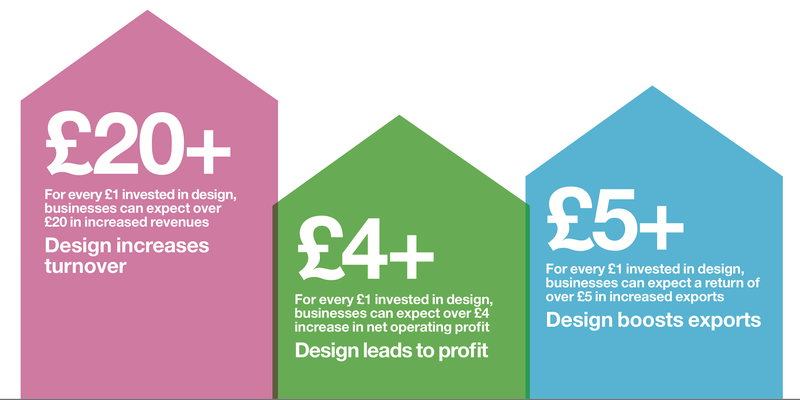 The UK’s Design Council found that every £1 spent on design led to more than £20 in increased revenue while researchers Herenstein & Platt found that firms with good design were stronger on virtually all financial performance measures. Design-conscious companies (you know some of them... Apple, Nike, Coca-Cola) know that design is a strategic tool that goes well beyond the “skin deep” attitudes of old. In such companies there is an inextricable link between design, brand communications, and their core offering. Reliable outcomes include boosts to business growth, improved capability and confidence and lasting impact. Design delivers tangible business results and positive cultural effects; it solves problems, creates, connects and builds trust. Put simply, design is good for business.